And Cafenoia affects those of us who have things to do places to go and people to chat up. These things happen with a lot less joy, energy and feeling when running on fumes. Is Coffee an addiction? Hell yes it is, an addiction to great tasting, productivity enhancing wonderfulness. 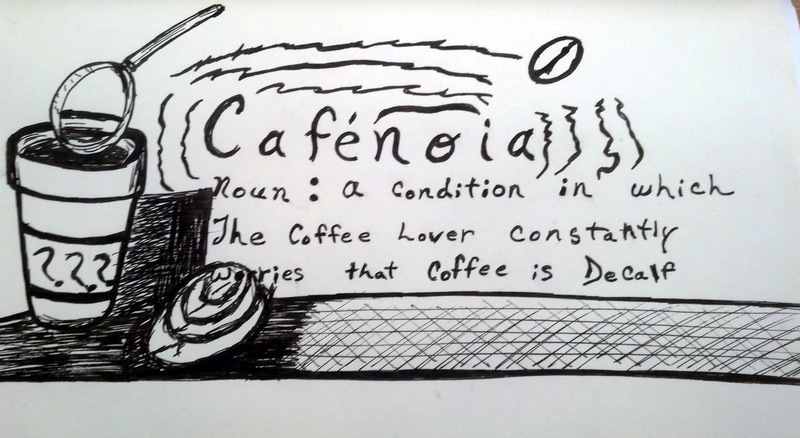 Cafenoia: A condition in which the coffee lover constantly worries that the coffee is decaf. More Coffee Words, and more lunchtime sketches. We are aiming to continue the series. I hope other people are finding them as fun as I did making them. If you missed any of the others So far we had Haute Coffee, Frankencoffee, Javatosis, Coffenundrum, Cafelexia!